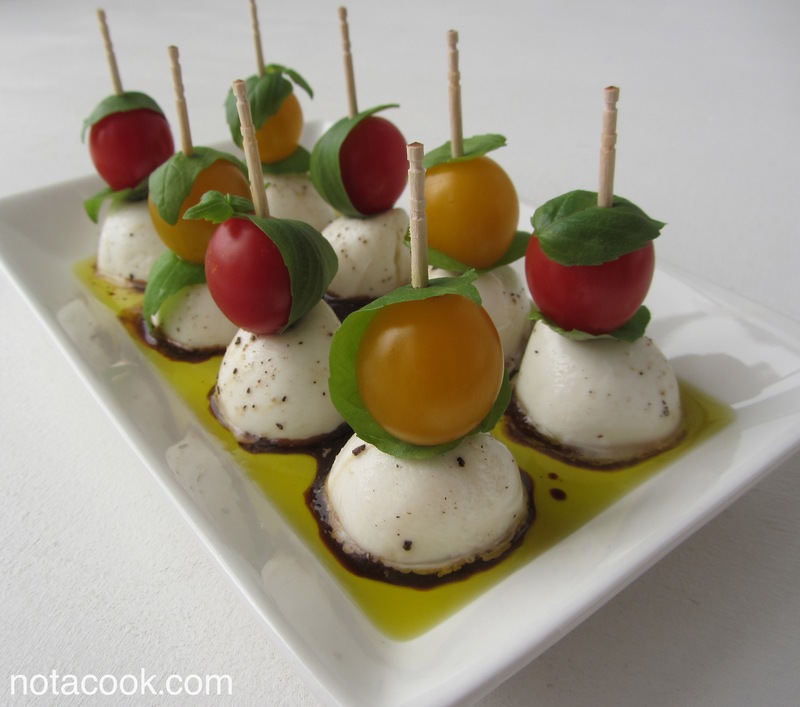 I always like to serve a caprese salad whenever guests are over. Its fresh flavors are light and crisp, and won’t weigh guests down, which is ideal for long evenings of chatting and laughing. Folks suffering from food comas are definitely not conducive to conversation! Normally I prepare the salad more traditionally: sliced and eaten with plate and fork, but in an effort to cut back on cleanup afterwards, I made these little skewers. They are a deconstructed twist of the traditional version, made to be finger-food and party friendly. 1. Drizzle enough extra virgin olive oil onto a plate to just coat the bottom. Sprinkle with balsamic vinegar. Set aside. 3. Build the skewers. Wrap a basil leaf around a tomato, then pass a toothpick through the two to hold in place. Top with a piece of mozzarella. 4. Repeat with the rest, then arrange onto the plate of extra virgin olive oil and balsamic vinegar. Season to taste with salt and pepper.